My mother is learning English. She takes private lessons once a week, plays audio CDs for English learners, while doing the dishes or laundry. She used to play Fujiko Hemming. 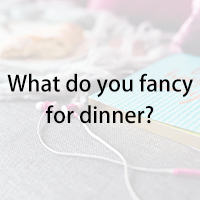 When I visited her over the weekend, quite out of the blue, she said, “What do you fancy for dinner, my dear?” Obviously, she has chosen to learn British English because Americans rarely use the word “fancy”. Fancy as an adjective means expensive or not plain but decorative. For example, we stayed in a fancy hotel in Paris. Or, I just want something simple, nothing fancy.